There's a small but active community of people who collect Robertson's tokens, badges and a vast range of other collectibles. Over the years, we've catalogued and researched new finds, and books and CD roms have been produced so that anyone else can learn from our research. Very recently, all of this information has been made available on the web (on a subscription basis). For more details or just to join up with fellow collectors, contact the Facebook group "The Robertson's Badge Club"
Hi I listed some of the golly stickers that you had in the jam jar lids but eBay ended my listing. I looked on eBay first and saw that golly items were listed so I thought this would be ok. I just loved the Golly's. I saved the tokens for them.. I have a load of paper tokens that my Auntie had obviously been saving and never got round to sending off. What posses any one to say the Gollies were racist defeats me. We all loved our Gollies. My big sister bought me one from Hamley's toy shop that was 4' tall. Gilbert was loved and in mint condition when I let him go with one of my nieces some 20 years later. Our gang hut was the back of a Robertson's truck resplendent with Gollys on the sides. It was a great feature in Watersheddings in Lancashire in the 1950ies. Political correctness is barmy on occaision. The sale of all Golly items, including the much loved Robertson's badges has recently been banned by ebay. Yes these lovely fellows have become very collectable, since their retirement form Robertson, the original ones are so beautifully made in enamel by a Birmingham Jeweller. I saw since listing my old chaps on ebay that the county cricket series can reach the giddy height of several hundred pound. If only I knew that before I listed him. I'm hoping a fellow Yorkshireman/women will find him and take care of him. I well remember collecting the tokens from the jam jars as a boy during the 1960's and the joy of receiving the lovely metal Golly badge in the post. Far from looking at our gollies as a figure of fun depicting black people in a derogatory way or as something to be looked down on they were a respected little emblem from our childhood. They were beautifully made with enamelled colours showing the Golly in smart clothes with a great smile on his face, something which cheered up breakfast time before going off to school. I doubt if any white person ever thought of them as depicting actual black people until the 'racist' tag was raised. Another bit of history consigned to the dustbin by the politically correct minority who we must not offend! They were after all based on the dolls owned by the black american children who called them 'dolly' which sounded like 'golly', white people can hardly be accused of racism over something that black poeople invented in the first place. One question, if we cannot produce dolls, badges, etc. with black faces because it may offend black people why are we still allowed to produce them with with white faces when this may offend white people? I remember collecting the Golly sticker off the jam jars. I had a Bruno comic book that I pasted all the newspaper comics and I had a special page for the Golly jam jar stickers. How sweet. 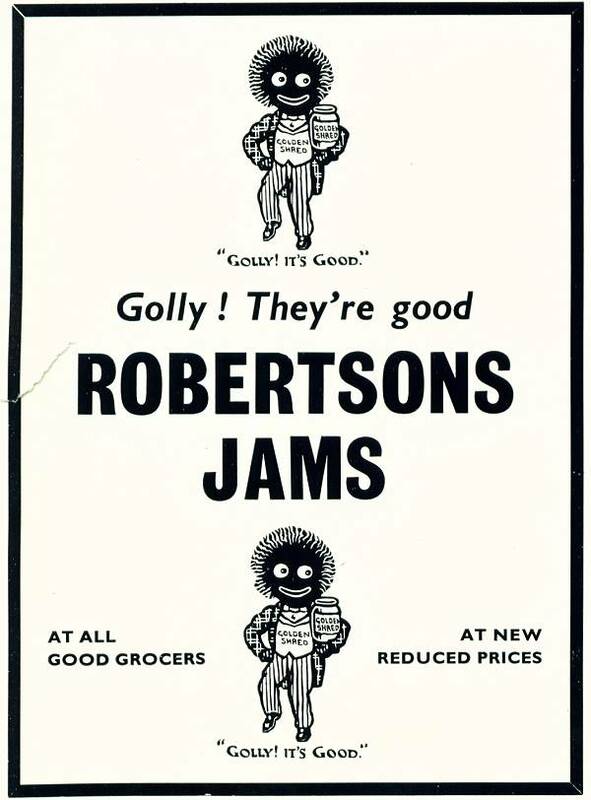 All positive childhood memories through my looking-glass~ Robertson's was the best jam! Since the pc idiots had the golly banned it has become more popular than ever. I`m glad to say. I remember saving the paper golly"s from the jam and sticking them on a card. I then sent the card to Robertsons Jams and they sent me back a metal golly badge.I think you had to collect 12 golly"s to receive a badge. I also remember that some of the golly"s played a sport. (tennis, cricket etc) I love nostalgia !!! Do you remember when they banned "The Jam" pop group from using the golly. Showed a total lack of humour plus the loss of some free advertising! LOL Christi...Ssshhh don't speak too soon....Loads of Gollies being sold on Ebay. Brings back happy memories eh. Ah!! I remember it well! At last someone HASN'T removed the Golliwog! Lovely to see.